The regional government has been taking measures to crush abandoned cars for the past decade or so, and only the ones that are well hidden have managed to stick around. Even cars on private property are not necessarily immune from imminent destruction because it is illegal to park a non-insured car in a driveway or a yard in most cities. 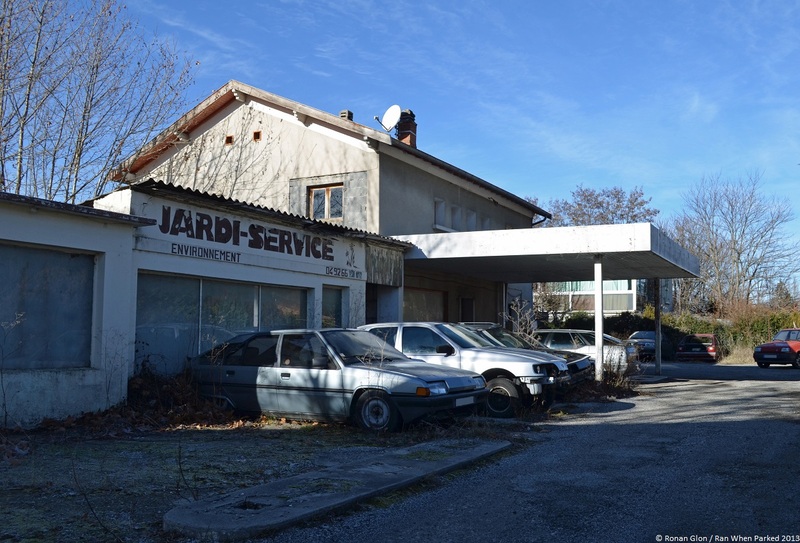 Unsurprisingly, the rules largely apply to urban areas and there are still plenty of abandoned cars hiding in plain sight in more rural places. The garage pictured below is a perfect example of this: Located in a small town in the Alps, it is right off of the main road and clearly visible to anyone who drives past it. If the sign is anything to go off of, the shop once specialized in repairing motorized gardening equipment such as lawn mowers and tillers. The business later diversified and morphed into a garage where LHM is spoken fluently. A quick and discreet walk around the property revealed a Jaguar XJ6, a Ford Sierra, three Citroën XMs and no less than five BXs ranging from an early 19GT to a late TZD Turbo wagon. The registration on the trailer visible in one of the photos below matches the license plate on the 19GT and we’re inclined to believe it was used as the owner’s personal driver. Some of the cars (including the dark red XM and the Jag) were registered outside of the department so they may have been left there by tourists following a costly break down. There were several houses around so we couldn’t thoroughly examine the cars one by one but we noticed a lot of them had their license plates, registration and inspections stickers removed. Although it is difficult to say when any of them last moved, it looks like nothing has been touched for years and even the relatively clean 19GT has been sitting idle for quite some time.